Before answering this simple question 'How to beat the casino odds', it is better just to think a little about the goal of every casino. So, have you found the purpose of the betting house? Yeah, of course offering of entertainment service to its visitors that presents the users lots of gambling opportunities and varieties of games. But dig dipper, we, the average players, receive some amount of money - more or less, but it is according the change and our general luck. But the casinos always receive money from our bets, every time they are filling their treasury with piles of our money. This is a real gambling life. House edge in general is just the benefit of casino over the players. Even if we see that, oh, the gambling odds are really high, it is worth trying and etc. We don't think about the fact that the house receives even more that we dream even when we find out how to play roulette or money-bringing slots. It's unfair a little bit, but what to do, just to become reconciled with this and maybe in some ways to look for such bets where our roulette chances are high and casinos' are not very. The casino has the advantages over each bet. But it's better to find the very trigger where we can outwit a little the wagering house. So, for example how the roulette edge is calculated in 5, 26%? For example, if you are accomplishing the straight-up bet which need the one bet from 1 to 38, you face the chances about 37 to 1 that you will win. But even if you have coped with luck, and you are the winner, you still don't receive the full payout - only from 35 to 1. In other words instead of 37$ deserved winning the player receives only 35$. Where is the rest? Oh, in that very accommodation in which you are leaving your money. Another betting situation, when you want to try yourself in the most dangerous six line bet, where the odds against your winning is about 5, 33 to 1, but the player's payout will include only from 5 to 1. 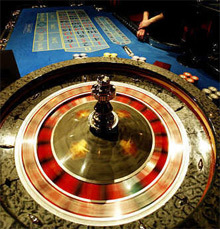 The same principle presents in the outside table bets, but here the odds and consequently the roulette payouts are less than in the inside table. Also don't forget the important fact of the differentiation between two variations - American roulette and European one. Here you will encounter different principles of house edges and maybe will find the safest one. So, let's remember that in the American variant the visitors come across two zero squares which noticeably decrease the odds of the gamblers, presenting the house edge of 5, 26% while European one has only 2, 70%. So this distinction is also very important and you visibly see what type to choose. Another allaying factor is the "En Prison" rule which is very convenient for the gamblers who are at the edge to lose all the money. In such a way you are cutting the house edge and cover your wastes, while the bet is located 'in prison' and is frozen till the next ball spinning. But if you don't win the following spin, then the house again has its benefit and you lose. The casino players still can have some advantage, while having the comps of casino and VIP cash paybacks. The most of the online casinos can award its users with bigger payouts and less house edge just to involve as much as possible of the roulette online visitors. So, look for the right casino and be sure that anyway your money is taken by the very house in which you are sitting and enjoying.